Oldsmobiles were redesigned for the 1957 model year giving a wider stance and much lower look. It was a look that had also ignored fins that were appearing on just about every other car of the period. They also had more powerful engines and a power package (the J-2) was available - which is exactly what's fitted to this 1957 Oldsmobile Starfire Ninety-Eight Holiday Hardtop Sedan in Alcan White over Grenada Gray. The Starfire name was used for Oldsmobile's Ninety-Eight Convertibles from 1954-1956. For 1957 it was used as a prefix for all models in the Ninety-Eight series. For some reason this was a one-year only affair and in 1958 they were back to plain "Ninety-Eight" once more. A three-piece, twin-strut rear window had made a reappearance. The oval taillights hide the gas filler and the dual exhausts exit through the rear bumper. With a wheelbase of 126" the Starfire 98 is 216.7" long and 76.4" wide. Engines were bigger this year with the introduction of a 371 cubic inch T-400 Rocket V8. In addition this car has the J-2 power package with 3 x 2-barrel carburetors producing 300 horsepower. Under normal driving only the center carburetor operates. This is paired with a 4-speed 'Jetaway' automatic transmission. Lavish gray cloth interior with Custom-Lounge Cushions is perfectly matched with the door panels. The optional Deluxe radio offers powerful six-tube full-fidelity reception. The front speaker is centrally located at the base of the windshield, which acts as a sound reflector! The Ninety-Eight was top-of-the-line for Oldsmobile and enjoyed standard features such as: an automatic transmission, powered windows, power brakes and power steering. Oldsmobile produced 32.099 Ninety-Eight Holiday Hardtop Sedans for the 1957 model year at a base price of $4,013. The car featured here is fitted with factory air conditioning as was originally built in the Lansing, Michigan assembly plant. Currently I have a 1979 Olds Cut. Supreme with 79K original miles. Garaged. In 1959 I bought a 1957 Olds (copper and creme color). Never had one problem. Actually the best car I have had until I got the Cutless. Age sixteen, I learned to drive in my father’s ’57 Olds 98 two-door hardtop. I took it for granted in those days. Now, it takes an arm and a leg to win at auction for one of these beauties. My father bought his 98 when he noticed a misprint in the Oakland Tribune newspaper for this J-2. Can’t remember how much it was off but my father took it in and demanded they sell it to him for the advertised price. I was waiting for him in the showroom as three sales people tried to talk him out of pressing the issue. Dad continued to insist, weathering their tirades. The outcome was that he bought the car for the advertised price but the traded-in ’55 Buick Roadmaster was valued at just a thousand dollars, considerably lower than its bluebook value. Then, I began reading the owner manual and realized our 98 had the J-2 option under the hood. I’d just learned about multi-carbed engines in Auto Shop, at school, and asked Dad if he knew what he had. I am not kidding that he said, “Oh, I love the idea of the “three-pot” on the motor, half-way between the four barrel and the two barrel”. I advised him of the actual installation and he laughed considerably….and then proceeded to arrange for the outside two-barrels to be disconnected and the intake covered. I was incensed, as I still am. I will say that Dad picked up nearly three mpg in making this happen but it wasn’t nearly as fun to drive for a sixteen year old son. Great memory don’t you think? The `57 Olds 98 is my personal favorite styling-wise, with the `60 model a very close second. 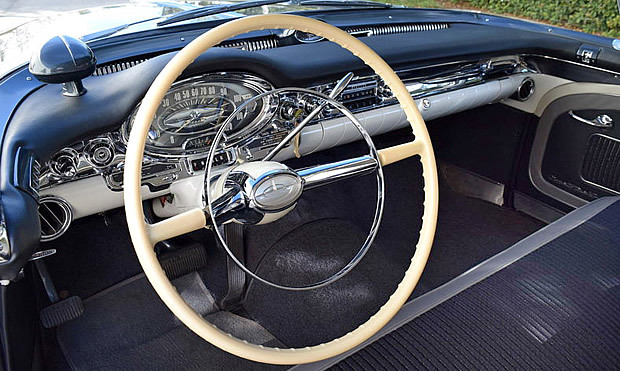 Olds did everything right on the `57, with sharp two-tone color sweep trim that had the colored insert to coordinate. I can still recall a babysitter I had in the very early 60s who drove an all-white 98 Holiday sedan, with red/white/black leather interior! She had (dyed, of course) jet black hair, and ALWAYS wore flame red lipstick! Turns out she was in HS with my dad, and he almost married her instead of my Mom!! Her name was Pearl Briggs, and was always my favorite sitter as a kid!